Legal interventions have helped poor people gain access to food, water, housing and healthcare, but they cannot transform poverty. The problem is that courts have neither the capacity nor the mandate to make the profound policy changes required to address poverty’s root causes. Consider India’s right to food case. In 2001, the People’s Union for Civil Liberties (PUCL) filed a petition on the right to food with India’s supreme court, following rising malnutrition and starvation-related deaths in the state of Rajasthan. The PUCL petition was an attempt to compel the government to launch famine-related public employment and food relief schemes. The Indian supreme court, backed by a huge public campaign, transformed several government food security schemes into constitutionally protected entitlements. The court also prevented the dismantling of India’s public distribution system, mandated subsidized food for people below the poverty line, universalised the Integrated Child Development Scheme for children and mothers, and ordered the Indian government to provide one cooked meal each day to students in public schools. 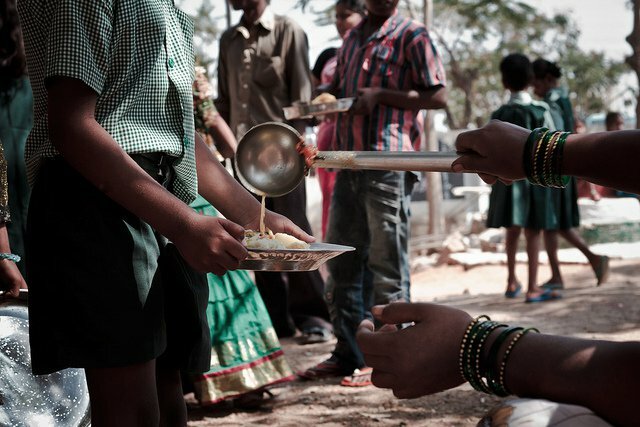 The Indian supreme court ordered the Indian government to provide one cooked meal each day to students in public schools. These were important gains. In a country where fifty-five per cent of the population is poor, access to free meals and subsidized basic foods will make a real difference. We must acknowledge these achievements, recognizing that any attempt to help the oppressed must be accompanied by practical support. Yet legal interventions of this kind are also limited. The petitioners successfully compelled the state to distribute cheap food to the poor, but they could not combat hunger’s root causes, the main one of which is poverty. Millions of people in India go hungry not because there isn’t enough food to go around, but because they can’t afford to buy it. In other words, they starve because they are poor, not because India doesn’t produce enough food. Combatting poverty, however, requires a transformation not only in the way in which food and other goods are distributed, but also in how they are produced, by whom, and under what conditions. Take India’s rural poor. As in much of the rest of the global south, most poor people in India live in rural areas, struggling to make a living as small-scale producers or agricultural labourers. Failing the creation of new and better income-generating opportunities – including those produced through pro-poor agricultural growth – the elimination of poverty in India will remain a pipe dream. The same is true when it comes to creating a world in which all human beings can meet their own food needs through their own efforts or resources, as required by international human rights law, and, as promoted by free market champions. International trade is just one area in which domestic and international policy must be radically overhauled. Poverty eradication in India also requires considerable changes to land use policy. For example, over the past twenty years, industrialization, urbanization and the shift from cultivated to commercial land have all concentrated land in the hands of the wealthy. As a result, farming incomes for the poor have been squeezed even further. Beyond trade and land are issues of social security, education and skills policy, and employment rights, to mention just a few. Power and influence must be wrested from the hands of the few, and placed in the hands of those directly affected by policy decisions. Major reforms of this kind are not easily achieved through legal interventions. What is really needed is sustained citizen mobilization and engagement with the policy-making process. Power and influence must be wrested from the hands of the few, and placed in the hands of those directly affected by policy decisions. Of course, litigation’s full impact should not be measured solely in legal terms. Even a narrow legal victory – or, indeed, none at all – could contribute to structural change, for instance, by sparking public debate or by inspiring political action. Yet legal actions can also have negative effects, such as disempowering victims by focusing on systemic legal change at the expense of a client’s actual needs, or by sparking a political backlash. Gaining a better understanding of how legal interventions shape, bolster or undermine efforts to tackle poverty’s root causes is critical. Scholars have produced numerous socio-legal studies providing insight into the pros and cons of civil and political rights litigation, but have yet to produce a similar body of work for economic and social rights.